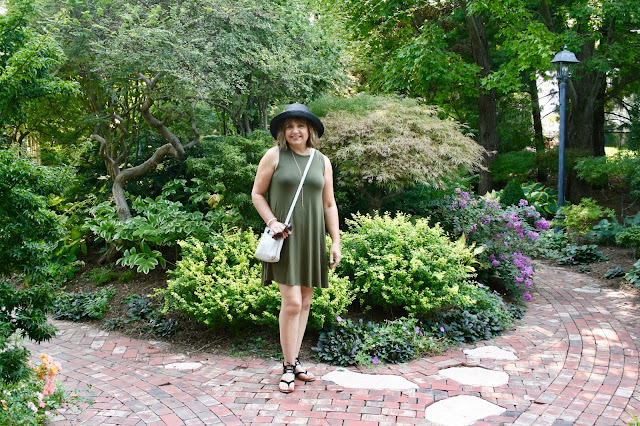 On Wednesday's Travel Post I shared about our visit to St. Charles, Missouri and I mentioned in that post that I would do a separate post of their beautiful gardens. St. Charles had gorgeous flower gardens, pots, and baskets everywhere I looked! 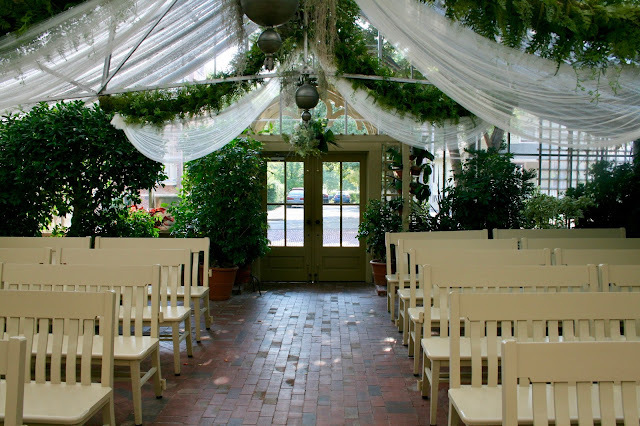 But perhaps my favorite place in St. Charles for flowers was "The Conservatory Garden Wedding Venue" : A Garden House for Weddings. We discovered this magical place when we spotted this beautiful bed of roses. 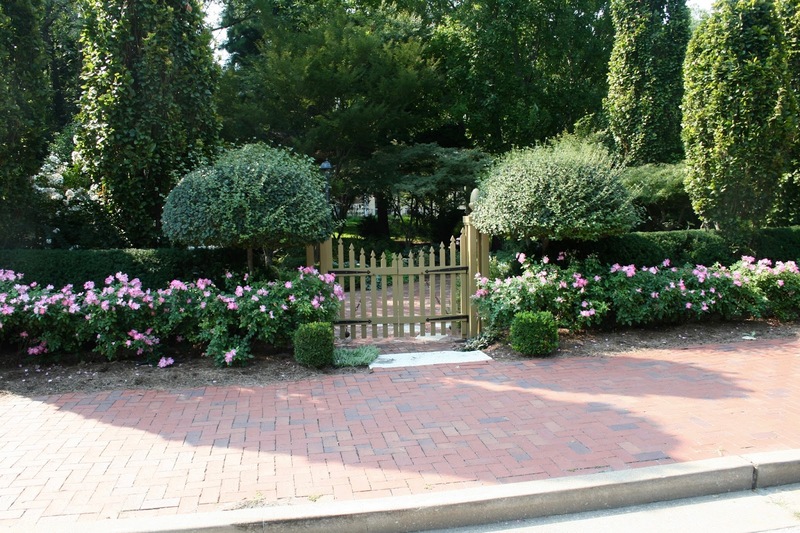 My husband beckoned me to go inside the garden gate but I was leery of it being a private garden. He reassured me that it must be a public space, so I cautiously went inside and I was immediately mesmerized by it's serene beauty. It was a lovely shade garden, filled with colorful and interesting foliage. 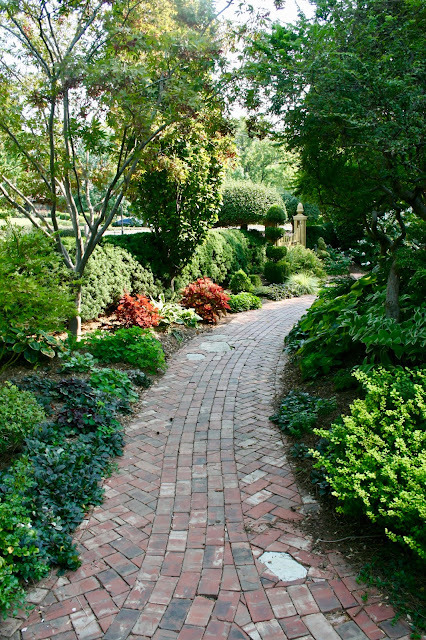 The garden beds were separated by a beautiful brick lined path. There were so many interesting trees and shrubs like the one below. My husband thought this was one of the most well done gardens he had ever seen, I couldn't agree more. 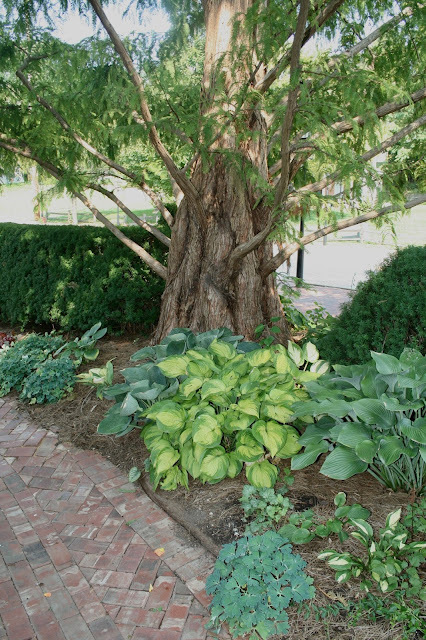 It was a textbook example of a perfect shade garden. It provided tall, mid-size, and small trees along with all different colors of foliage to provide color even if nothing was in bloom. We absolutely loved the lamp posts too! 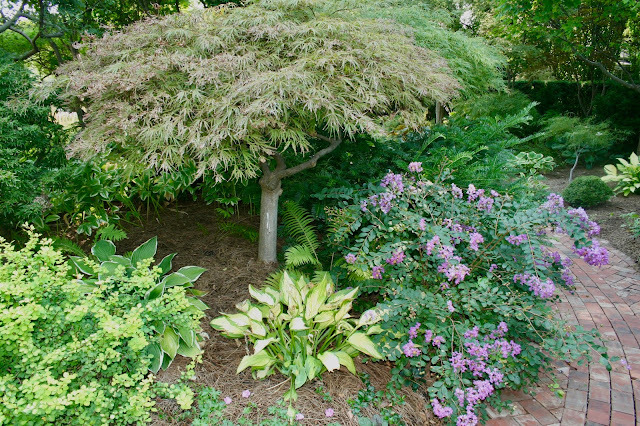 I love the smaller height and texture Japanese Maples provide in a garden. I wish we could grow them in Zone 4. I had so much fun exploring all the little nooks and crannies of this small city garden. Little did I know the best was yet to come beyond the trellis gate! 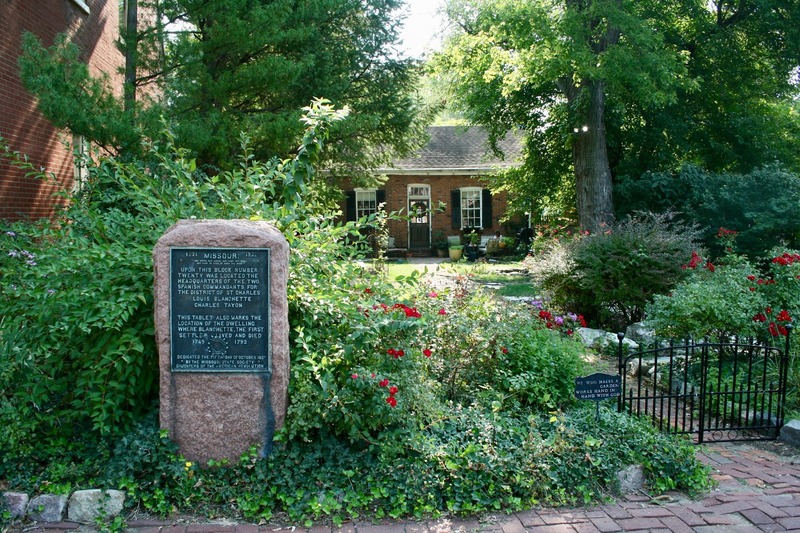 At the entrance to the garden was a smaller garden with a brick house and a greenhouse. 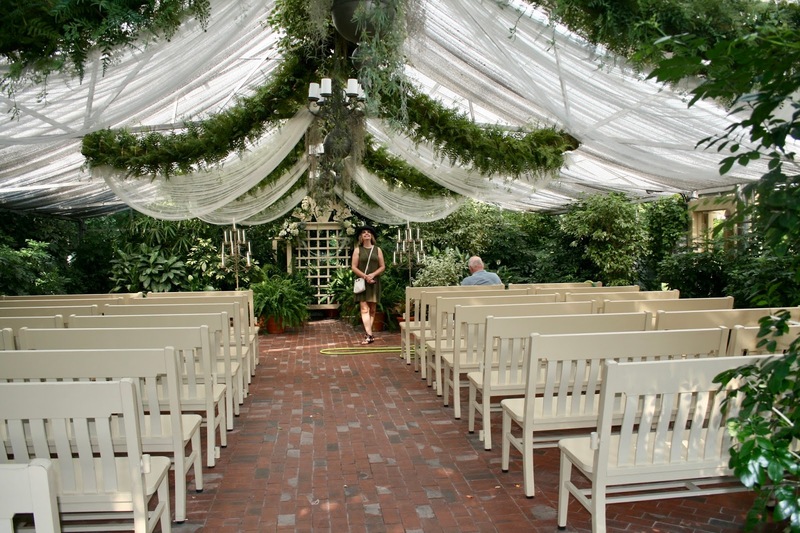 Inside the greenhouse was the most beautiful wedding chapel I ever saw! Can you believe these decorations? They draped yards of tulle from the ceiling and created live plant garlands with moss, ivy, and ferns. They even added beautiful candle chandeliers! 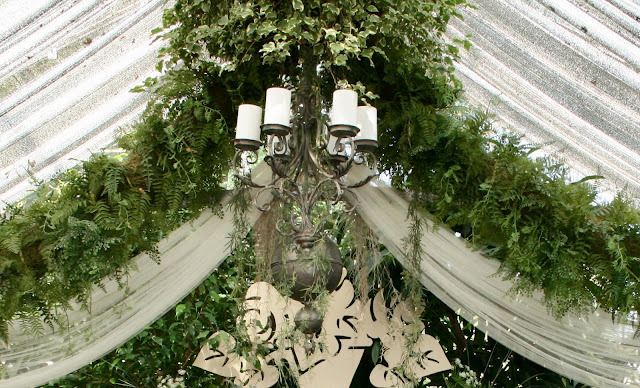 I would have loved to have seen these decorations before my own daughter's wedding! I could have copied these ideas! 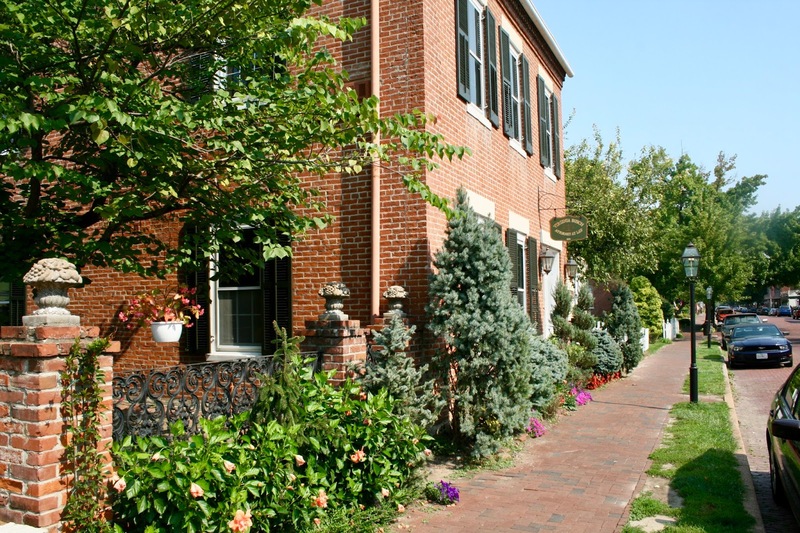 This is the street view of the wedding greenhouse. Isn't it just stunning? I love the doorway! Even the ivy climbing the Conservatory's main building was perfect! 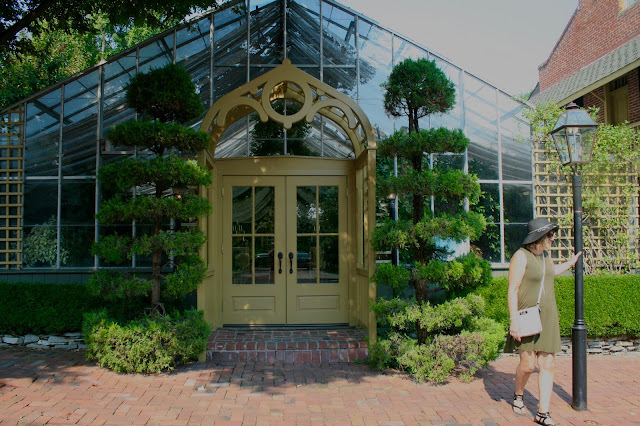 There were rooms for the bride and groom with outdoor access to the gardens in this building. Even though The Conservatory was our favorite garden spot in St. Charles, we still saw so many other beautiful plants, flowers, and courtyard gardens during our visit. I liked all these blue conifers growing so close to the brick building. The owner must really really keep them trimmed to keep them from overgrowing this small space. Wrought iron fences were a common sight in St. Charles as well as roses! 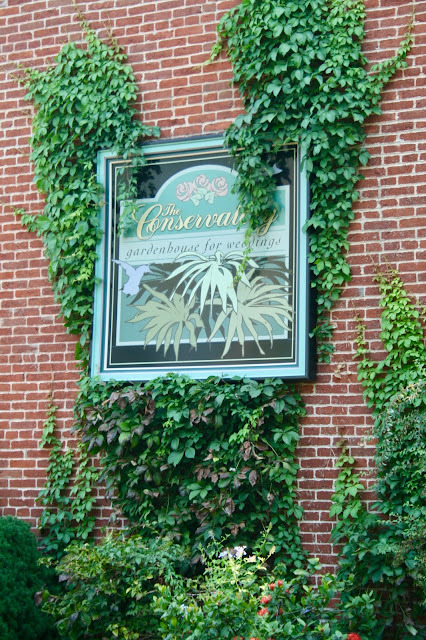 But flowers weren't the only natural objects adorning the streets of St. Charles. 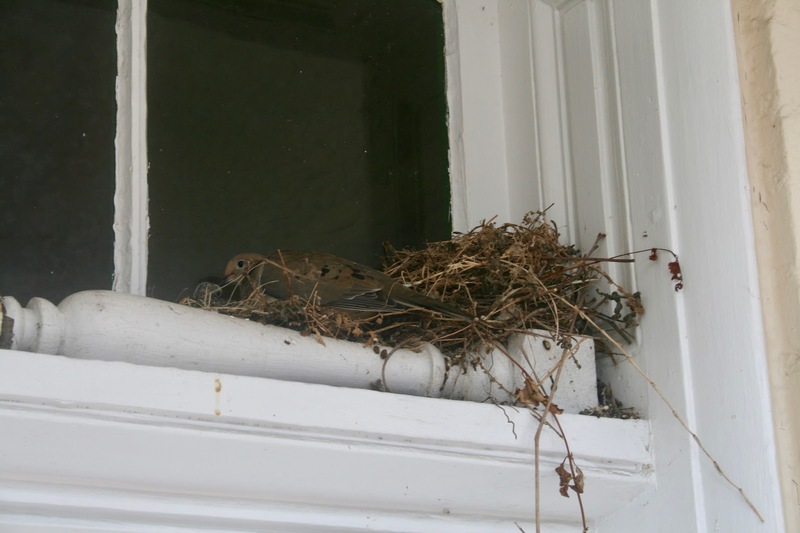 We also spotted this bird and nest right above the door of a business! The owner said she has been nesting here for five years! 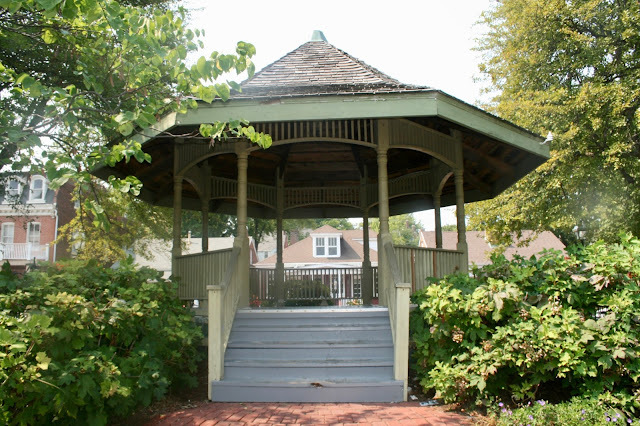 There was a small park with a gazebo located right on main street. My favorite homes in St. Charles were the tiny ones like this. 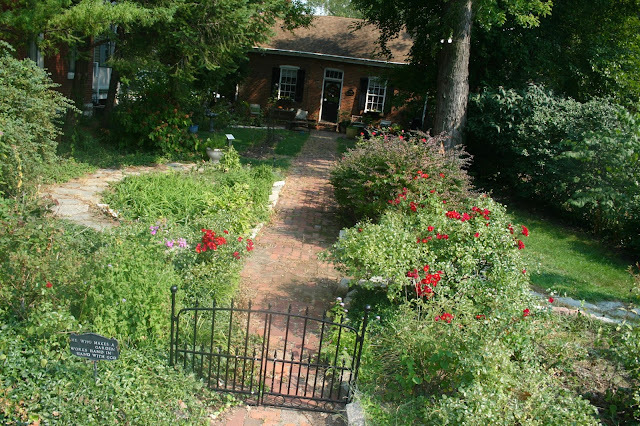 We saw so many adorable tiny homes in St. Charles (along with large, grand ones as well). This tiny house had a beautiful and very large front garden. I sure wouldn't mind living in this little house, would you? Really nice pictures, I love the garden and the wedding decorations! But I really thought you did an amazing job with your daughter's wedding decorations even if you didn't have this as inspiration. The little house looks really cute, I'd love to have that kind of a yard! Aww thanks Elli! I actually had a lot of help with my daughter's wedding, I never could have done that on my own. 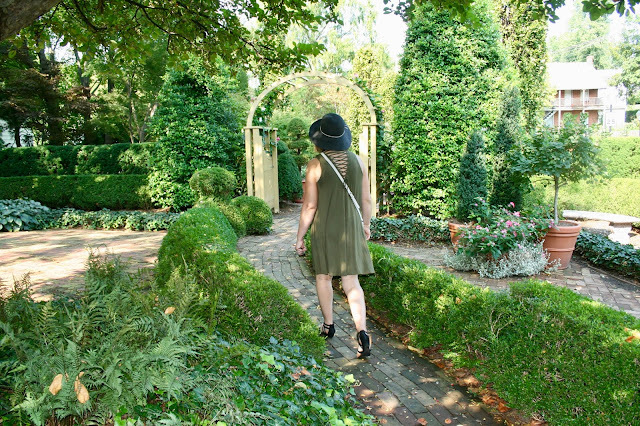 Oh Amy, such pretty gardens. You were so lucky to discover them, thanks to your husband venturing in there. The glasshouse is just sooo pretty. And I've learned a new word, leery, so thanks for my mot du jour! Hugs, x. Well I had to google "mot du jour" because I had no idea what that means...so you taught me! That's the fun thing about blogging with people from all over the world...we learn so much from each other! Thanks for sharing this. 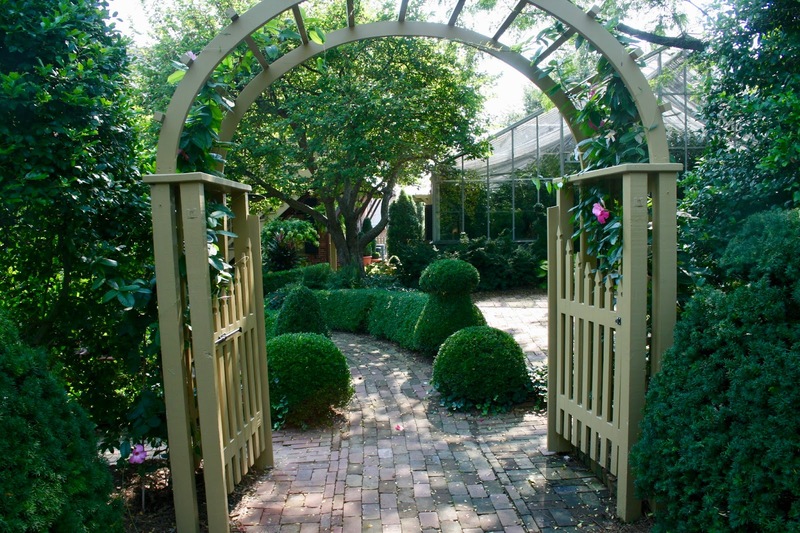 Wherever we travel, I always look for gardens to visit. Me too! I always check out the local botanical gardens! What beautiful gardens! Cute dress & hat!